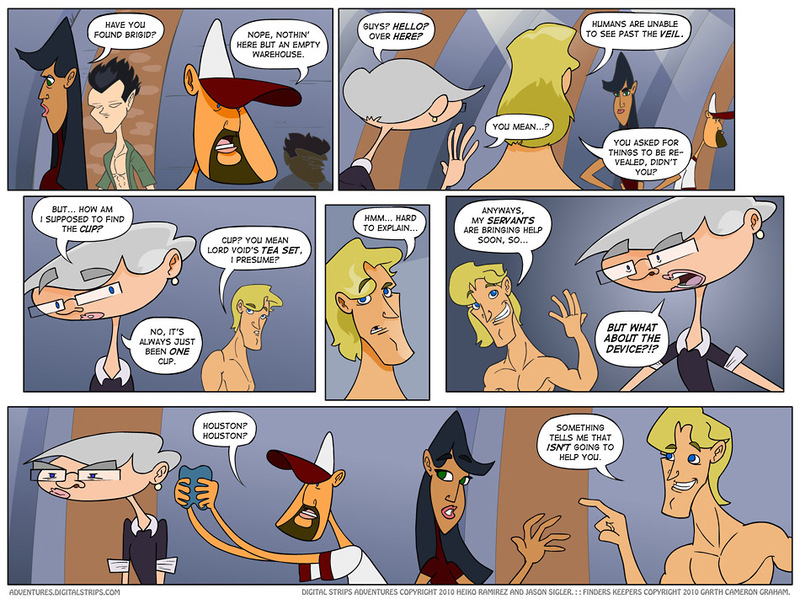 Alright, so on top of all the crazy, all-in-your-head-but-did-that-actually-happen stuff that usually goes down in Finder’s Keepers, we’re now dealing with at least multiple planes of existence within one story, as it appears Bona and The Geek cannot see Brigid, nor the world she currently inhabits. But where did they end up? And did anyone else get stuck with them? We’ll find out more about that next week. For now, enjoy the shirtless wonder that is Life, because he won’t be with us too much longer. Gruesome death at the hands of the Umbra? A fate worse than death? You’ll have to come back next Monday to find out! Theory: Lord Void’s tea set simultaeneously exists on both sides of the Veil. Both versions of this world’s cup have to be touched at the same time.